This post has nothing to do with celebrating Canada, except that it sure is lovely eating waffles and if a holiday tempts you into making the effort, then by golly, make waffles!! The best waffles I’ve ever eaten were at Roscoe’s House of Chicken n’ Waffles in Long Beach, CA while we were on our honeymoon roadtrip through California & the Southwestern states. While it may seem like a strange pairing of syrupy waffles and fried chicken, it was heaven on a plate. So when we received a waffle iron as a wedding gift, Cornelius and I tried very hard to replicate the lightness and crispness of those fantastic Roscoe’s waffles. And though we’d never complain about all the waffle bounty our wonderful waffle maker has doled out over the year, we still dream about hitting up Roscoe’s again. 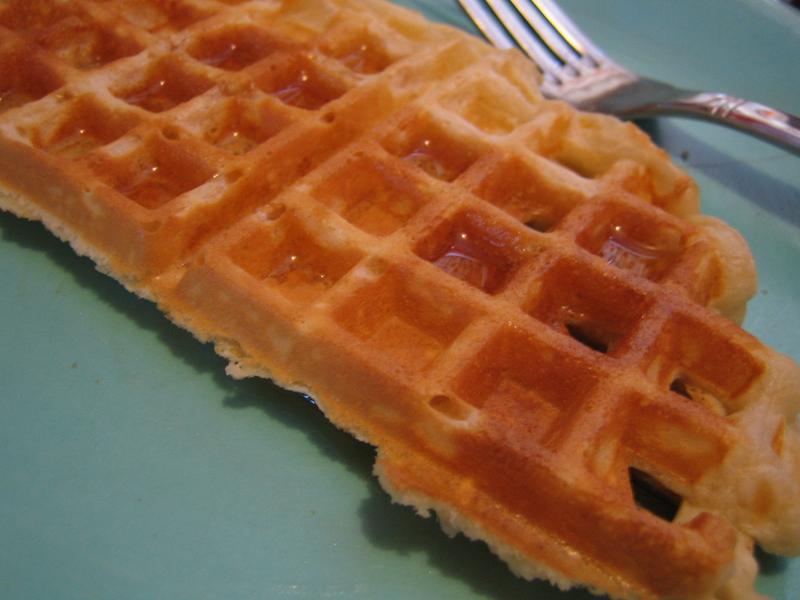 On this holiday weekend morning, I decided that waffles would really hit the spot, so I looked at my standard waffle recipe and hoped that I had enough milk in the fridge to make it happen. I was a 1/2 cup short so instead of scrapping the waffle idea, I improvised by adding the juice of a lemon with it’s zest and the results were fantastic! Lemony, light and crisp these were very fine tasting waffles and since visiting a Roscoe’s House of Chicken n’ Waffles would involve a couple days of driving, I think these waffles will do nicely. 1. In a large bowl, mix together the flour, baking powder, brown sugar and salt. 2. In a measuring cup, beat the eggs and add the milk. Pour into flour mixture and mix lightly. Add the melted butter, lemon juice and lemon rind and lightly mix until combined. 3. Heat waffle iron and spray with vegetable oil. Cook until golden brown. Serve with syrup or be decadent and serve with whipped cream and fresh berries. I knew it was a holiday today just couldn’t remember which one. Sometimes you have to remind us dullards south of the border! Happy Canada Day! Yummmmmmy waffles! Thanks Jennifer! For some reason, Vancouver doesn’t make a big deal of this holiday which is strange, but it’s still a nice day to relax and enjoy! If you separate the eggs, beat the whites, and then fold them in just before cooking, you get some extra crispness – and a certain degree of airiness.